Walkers, Canes & Rollators | Collections Etc. Whether you’re suffering from age-related mobility limitations or are recovering from an injury or operation, you’ll appreciate this vast assortment of mobility aids from Collections Etc. Our team has hand-selected top-quality walkers, canes, rollators and accessories to help you get from point A to point B seamlessly and with less risk. Shop affordable options that are tailor-made to your unique conditions and help you get back to your independent lifestyle. 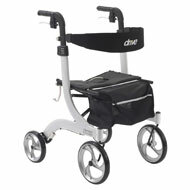 We have mobility options ranging from basic, economical canes to deluxe walkers and rollators. Give your strained joints a break with a steerable knee walker — ideal for those who need additional support after surgery — or go wherever you need to go using a walker with a built-in seat for occasional rests. Complete your purchase with walker organizers and tennis ball glides from Collections Etc. to make any mobility aid suit your individual needs.